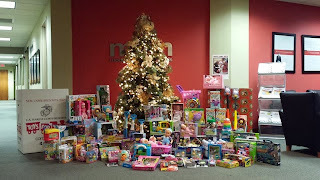 MOM’s mountain of toys for Toys for Tots! To get into the holiday spirit this year, the MOM Wellness Committee organized another Marine Toys for Tots, toy drive. Our Wellness Committee has been around for just over a year now and has organized a number of successful employee contests and thought, the holiday season is time to focus on both person and emotional wellness through giving back. The Wellness Committee came up with a contest called Jump START Your Walking to run in conjunction with our Jump START Your Nonprofit program for local nonprofits. 68 MOM employees participated in the contest where all you had to do to win was…WALK! Employees all wore FitBits to track their walking for 8 weeks. During the contest we watched employees literally step up to the challenge! Some said it helped them get off the couch at night, others took to walking during lunch, and towards the end of the competition some employees we racking up over 20,000 steps per day! Depending on your stride, that comes out to be over 10 miles a day! The contest ended a few weeks ago…but that hasn’t stopped some of our employees. Many have kept their Fitbits and continue to wear them on a daily basis! This blend of giving back to our communities and making efforts to better the health of our employees has made 2013 a great first year for our Wellness Committee. 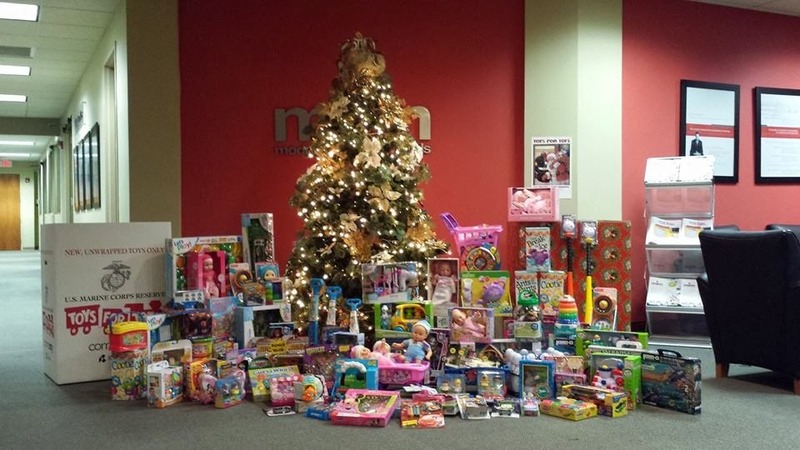 With over 100 toys donated for the Marine Toys for Tots, we definitely ended the year on a high note! All of us on the committee look forward to building upon this momentum as we move into 2014 and bringing our employees more programs where they can better their personal health and give back to our community at the same time.